With the release of Windows Live Local, we all need to start thinking about how our businesses appear from the air. 1. Text, Fonts, and Character Counts. With bold, florescent colors, businesses can draw customers to their busineses with phrases like “Good Pizza” or “”Divorce $199.” But with the size required (around 8×10′) you’ll have even more limitations than Google Adwords. We are reviewing what kinds of birds-eye ad copy works best. 2. Local Live Birds’ Eye Crawl Warnings. Microsoft will be updating us all whenever they send the satellite. Always be sure to clean up your parking lot and get that junk off the rooftop before they come by. Be sure the pigeons haven’t mussed up your letter arrangements. 3. Local Live Birds’ Eye Sandbox? There is some evidence that new buildings and properties are not immediately showing up. This “sandbox effect” has been seen in other search engines. You may wish to put up a small building while your larger one is being built to attract the crawlers and date your property. 4. Local Live Birds’ Eye Bombing? 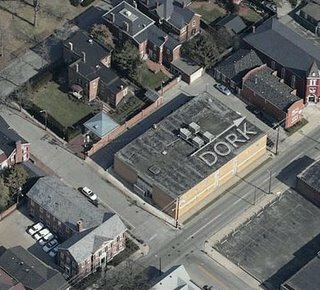 If you plan to put up a giant “Idiot–>” on the building next to your competitor’s, be sure that it will show up well in birdseye angles. Don’t rent the rooftop of a building that will be obscured during the photo. This is considered slightly black-hat. 5. Local Live Birds’ Eye Analytics? Currently, the only way to do analytics on the rooftop marketing is by asking customers to say what they saw on your roof. So if you want, you can put an icon for, say, a chicken, and then have customers tell you what’s on their roof. If they buy from you, be sure to note it down. 6. Property Shape. Round properties tend to do better in Birds’ Eye view. Putting a bright line of paint or stones around the edges can increase viewings of the property by 20%. Don’t put a big smiley face on the round property, as this is considered Birds-eye spam and MSN might come by and muss it up because everyone is doing it and it’s silly. 7. Landscaping. Pear trees are very good for birds eye views, as they grow fast and have a decent sized canopy. There is some evidence that there is a slight preference for white and yellow flowers arranged in zig-zag form. Please don’t create pornographic shapes with your plantings in order to get attention, as this is considered sky spamming. 8. Junk Piles. Some businesses are experimenting with junk piles. This is considered a black-hat technique and surely the effect will go away after a while. We don’t recommend that you rent dumpsters and fill them with florescent paper to get attention. One client rented 25 school busses to spell out “Yum!” near their restaurant which worked pretty well. 9. Animals. We’ve noticed that businesses with animals on the property are getting a slight edge. One of our clients has a pond with a large turtle that seems to be attracting some eyeballs. One of our larger clients is looking into a hippo for their lot. It remains to be seen how this will factor in. 10. Bad Neighborhoods If your company is in a bad neighborhood, you may have trouble getting results from birds-eye. Well lit, clean streets are critical to performance of your birds-eye marketing. A little fun for the weekend! We’ll see how it goes….